Have you ever driven by a home with rooftop solar panels and thought, “We should do that!” Well, now could be your opportunity with DC SUN (DC Solar United Neighborhoods), which is striving to make solar power more convenient and affordable. This group uses the “Costco philosophy” — buy in bulk to cut down on costs. By going solar with other neighbors, you and other participants can save on the total cost of purchasing and installing each system. This means you’ll save about 20% on your own rooftop system by avoiding the “solo-solar” route! The all-volunteer DC SUN is not affiliated with any specific installers and focuses on being a consumer advocate for solar systems and helping to create neighborhood co-ops. There are more than 10 co-ops in several DC wards now: Ward 1/Mt. Pleasant (November 2013), Ward 2/Georgetown (August 2015), Ward 3/Upper Northwest (April 2014), Ward 4/Petworth (October 2013), Ward 5 (March 2014), Brookland/Ward 5 (October 2014), and Ward 6/Capitol Hill (February 2014). DC SUN holds informative meetings and acts as a conduit to get people interested in bulk purchasing as a co-op in neighborhoods around the city. Once 20-30 homes are signed up, the group can move forward to bid selection from a pool of local installers. Even though the group will select one installer, each participant will own their system and sign an individual contract with the installer (but will get the group discount!). 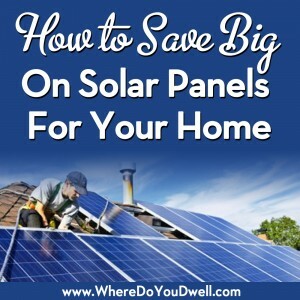 The cost of your solar system will depend on its size, which is measured in kilowatts (kW). A typical row house in DC has space for between 3 and 5 kW of solar. The initial upfront cost of a 3kW system will drop to $7,050 from $13,500 with the group discount and the Solar Renewable Energy Credit (SRECs). But remember, a solar system will generally offset between 30-60% of your home’s monthly electricity use… good for the environment and good for your budget in the long run! By being part of a group, you’ll reap several benefits by working together. More negotiating power with installers. One installer will have 20 or more customers interested in hiring them…why wouldn’t they want to work it out! Save time and costs due to efficiency. Installers will be purchasing large quantities of panels at one time and working on homes located in one particular area. Create a community. By organizing neighbors into a co-op, you’ll band together with others interested in energy issues and solar power. Plus, you’ll go through the process of learning about solar energy and financing it together within a knowledgeable group. Having a rooftop solar system requires upfront payments (or financing) but the benefits will soon outweigh any costs. You’ll save on electricity costs overtime but you’ll also reap some government incentives such as a 30% federal tax credit (not exemption) and have the option to take an one-time cash payment of $1,250/kW via the Solar Renewable Energy Credit (SREC) program through PEPCO. As you can see, there is a solar movement in DC and you can be a part of it! For more details, check out http://www.dcsun.org/ on solar energy options in the DC area. Words alone cannot describe Jennifer. She possesses an amazing personality and presence. You just have to meet her. Jennifer is extremely knowledgeable, professional and particularly in my case, patient. She took my vision of the prefect home and wouldn’t let me settle until we found it. A true passion for her work, friends, family and hobbies are evident. She definitely fulfilled all of my real estate needs. I look forward to working with her again.